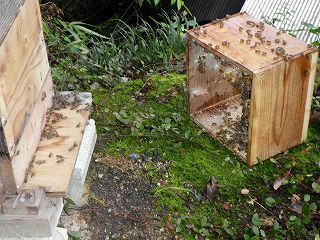 Two months of about one year have passed no doing squeeze honey after it begins to keep a Japanese bee in April, 2010. About 1/4 of the nests was done, and because the nest in the box grew, it caught and honey decided to be done. The size of the nest in the nest box is confirmed. After it began to have kept a Japanese bee on April 25, 2010, honey was never squeezed. It filled in the box in the nest. The state in the nest box is first removed the slide bottom board, taken a picture from the nest box under with the digital camera, and confirmed. In general, I think it is unquestionable for taking the nest of about 1/3. The nest of 1/4 was taken this time and squeeze honey was done. The board on the nest box is separated from the nest. First of all, the lid on the nest box is removed, flat screwdrivers are inserted most between the board and the nest box on, and the space is expanded a little. The wire is put in this space and it separates little by little. This photograph detached the board on the nest box. 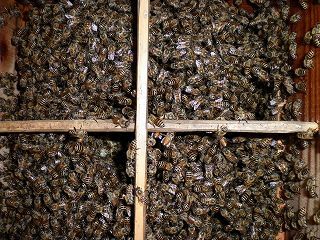 Under such a condition, the edge of the nest box is beaten with driver's handle, and the bee is bundled off below blowing with the straw and crowding. Next, the flat screwdriver is inserted on between the first step and the second step, and the nest between the box and the box is separated with the wire similarly. Doing on in squeeze honey depends on Japanese bee's habit. A Japanese bee saves honey on the nest, and there is a habit of taking care of a child under the nest. The basket made of the stainless steel is put in the big bowl made of the stainless steel, Japanese bee's nest is broken in that, and put it. Honey collects in the ball dripping when putting it how long. This is filtered with gauze and the cloth. 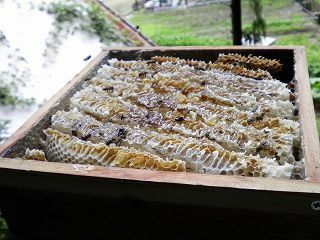 It is the one that honey doesn't drip easily that the temperature is low. It applies to direct sunshine or it warms it a little at that time. The honey that places to the nest box is returned to a Japanese bee. The honey that places to the nest box, the bowl, and the basket after it squeezes it is returned to the bee because it is too good when flushing it. Bees beautifully clean it only in putting near the nest box. When the box is used at once, boxes are used most below. Because the under was a slide bottom board, it used it for me. There is little thing attacked even if squeeze honey is done because a Japanese bee is obedient. However, please put on the side cloth of the net so that it is not stung by the bee. Please put on long-sleeved shirts even in summer. Piercingly from clothes when it is a too thin cloth. A thick shirt might be a little good.